A Carter Dickson Celebration continues – some would say has its legitimate beginning – with 1934’s The Plague Court Murders. After all, as I discussed in our first installment, The Bowstring Murders, written on the fly for quick cash, was actually published under the alias “Carr Dickson,” and John Gaunt, the dipsomaniacal sleuth of that novel, would immediately vanish forever into the literary ether. Still, the success of that novel cemented a new relationship between John Dickson Carr and his alternate publisher, William Morrow, allowed him to ply his trade on multiple fronts, and brought to life a more singular and entertaining sleuth than Gaunt could ever hope to be: Sir Henry Merrivale. Greene interprets this to refer to the single-mindedness of the plots found in the H.M. books. Compare the complexity of The Crooked Hinge – which features a question surrounding the true heir to a fortune, a backstory featuring the Titanic, a subplot involving a witches’ coven, and a bizarre impossible crime that might have been committed by an automaton – with The Plague Court Murders, which features a locked room surrounded by mud. I’m oversimplifying a bit, but there is a tendency for the Dickson titles to center on a single miracle: the lack of footprints in the snow, the couple who walk off a cliff and disappear, the room of death, and so on. Greene’s distinction between Carr and Dickson centers on this “focus on one problem,” but he hastens to add: “This is not to say that the stories are any simpler than the Dr. Fell novels being written at the same time; the twists and turns, the redirecting of suspicion are as complex as anything in the Dr. Fell saga.” The problem, according to Greene, occurs when Dickson tries for more complexity and adds an “unnecessary complication” which weakens the mystery. I read The Plague Court Murders eighteen months ago. You can access my review here, and it is not my intention to re-assess it but to offer a few new observations and then rank it. Although the novel marks the debut of Sir Henry Merrivale, he appears extremely late in the tale. Instead, the bulk of the detection goes to Chief Inspector Humphrey Masters, whose name actually appears on the cover of my copy of the book. The thing I love about this is that it establishes Masters’ credentials as a police official worthy of our respect instead of a Lestrade or Japp whose job it is to take statements and then step aside for the real sleuth. Although he resembles Mycroft Holmes in physicality and humor (and has also been said, perhaps falsely, to have been inspired by Winston Churchill and Carr’s own father), Sir Henry is jovial and jokey, one of the warmest sleuths in the canon. 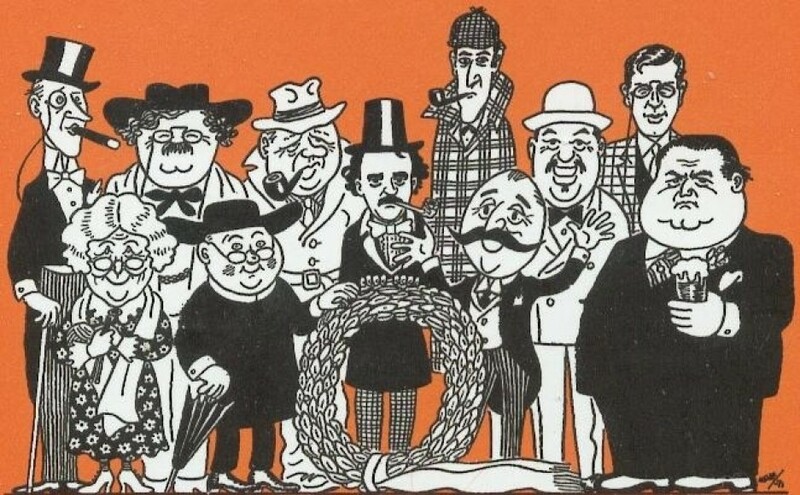 I think in retrospect that one of the things that drew this young mystery reader, who had cut his teeth on Hercule Poirot, to Carr was the richness of atmosphere and character that I did not find in Christie. Of course, my only resource back then was Dr. Fell, but it is clear upon reading Plague Court, even with so relatively brief an appearance, that H.M. is one of the leading assets of this series. He dazzles with his ratiocination like Holmes, but it is tempered by both the eccentricity that Christie also imbued in her sleuths and by a sense of warmth and humor particular to Carr. Comparing this novel to The Bowstring Murders is almost an exercise in silliness. Both take place in striking residences, but Bowstring Castle never comes to life, despite the constant descriptions of its vaulted rooms and maze-like passages. There is virtually no history to the place and no reason why anyone would choose to live there; perhaps the reason that its lord and master is presented as a loony is to provide any sort of context to explain why someone would choose to live in this drafty, awful place. Plague Court, by contrast is a long-standing family home, rich with dark and murderous history. If most nefarious ancestors in Carr and Dickson turn out to be red herrings, the author still weaves them expertly into his stories. The tale of Louis Playge, hangman’s assistant, is one of the best, and the courtyard in the center of the house that he seems to haunt and where the murder takes place comes to life as brilliantly as the armor museum in Bowstring Castle does not. The same goes for the circle of suspects in Plague Court. I spoke about them in detail before. They are a varied lot, easy to picture going about their shady business on a stormy, murderous night. The plot and solution to this novel is way more complex and satisfying than in Bowstring – too complex, perhaps, and possibly in violation of certain expectations readers have of their classic mysteries. To be honest, the whole thing was so complicated that I couldn’t quite remember its details when I came to write this! But I remember being flummoxed and satisfied in the sense that I had been taken for a helluva ride. With Plague Court, Dickson was just beginning the H.M. saga and still seeking its voice. Doug Greene bets his readers that the origins of the novel reside in an idea for the essentially Gothic and gloomy Bencolin, and the presence of Sir Henry whose humor, at this point, pretty much lies in his dialogue, is both a welcome balm for the period suspense and a little bit jarring. Dickson would shake out the character in subsequent novels and then, from what I’ve heard, go overboard on the slapstick. Next > SINISTER OR SILLY: When Does Agatha Go Too Far? Yes, a huge leap forward from the OK but nothing more Bowstring. The late introduction of Merrivale into this book really caught me by surprise at the time that I read it. Having read enough Carr novels at that point, I kind of expected the detective to show up by the midway point. And it was strange to see how a character I was already so familiar with emerges onto the page. It felt like something special when I read it. It’s like you know the character he is going to be, but the unaware reader would not be prepared to assume that this is the guy who is going to solve the mystery. It’s interesting to compare that to the introduction of Poirot in The Mysterious Affair at Styles, which I read recently. Perhaps it’s just me, but it could have been Poirot’s 15th book as far as that was concerned. It was like Christie already knew who that character would be and how he would be used. Though Merrivale starts as a fairly serious character, he becomes increasingly comical as the series progresses. This is okay to a certain extent but sometimes his comical antics are so grotesque that they tend to irritate rather than amuse ! My main objection is as follows: Darworth inflicts several injuries on himself and then Joseph (Glenda) is to shoot him through the tiny window to add other injuries at an angle he could not have managed by himself.This is not only highly painful and dangerous but totally unnecessary for a scam.Only a loony would attempt such a feat ! Also, an important information that Glenda was a circus performer is withheld from the readers.. While this is an excellent start to HM’s career, I think it is a bit overrated because…. I agree with Santosh’s first point. Darworth’s behavior was nothing short of lunatic. In HM’s words, “Those two (Darworth and Glenda) were playing a gentle, polite, murderous game against each other”. Darworth must have known that Glenda/ Joseph was a source of danger to him, yet he plans an elaborate scheme and gives Glenda the opportunity to kill him in a foolproof way! There were other aspects of the solution, too, (The main impossibility, The solution of no footprints, Mcdonnel’s involvement etc.) which didn’t convince me but overall for its atmosphere, misdirection and twists & turns, I’ll happily give it four stars. Yes, I agree that Mcdonnel’s involvement is somewhat unsatisfactory. We are given no hint of this prior to Merrivale’s revelation. The reader would think that Joseph has a strong alibi. Feel free to delete this comment, as I’m really not trying to stir things up and I can imagine how this could rub people in the wrong way, but… some of the spoiler comments in this thread seem overly explicit. I can get complaining that “a particular occupation isn’t mentioned”, but why call out the characters by name? I can understand complaining that the motive behind the method is questionable, but why explicitly state how it was achieved? I understand that we’re marking our comments as containing spoilers, but the entire solution to the story is somewhat handed out above in a single sentence. If some poor soul stumbled upon these comments while interested in learning about the Cater Dickson library, skimming through could lead to way too much information before the eyes have a chance to dart away. Why not keep things subtle? Why not talk about the interesting controversy in a general sense, but without including enough detail to let someone who glances at the content put two and two together? I totally get your point, Ben. I also want to let people who have read the book talk about things, and I URGE anyone who sees the words SPOILERS in a comment to avoid them. I am completely embarrassed to admit that I don’t remember any of these details of the solution, so a re-read of the book has actually been spoiled for me. Agree with both here – some massive spoilers and, while I know the book pretty well myself, I can imagine this kind of thing would be annoying in the extreme to anyone who happened on the piece without having read the book. I don’t think it’s necessary to go into that kind of minutiae in discussion, nor do I think some of the objections contained are really all that valid – surely enjoyment of a mystery novel isn’t dependent only on this kind of detail, I know that’s not the case when I read something. The series continues! This is an exciting journey you are on Brad and thanks for taking it. I read Plague Court early on and it blew me away. It’s one of Carr’s books which left me generally frightened while reading it, some of the scenes with Louis Playge back story are amazing, and I am thinking about how creepy the cat is early on while Masters is on the scene. Amazing quote from Greene’s biography about ‘Hackneyed situations’ that’s fascinating! I now want to look at all the Dickson books and see if they come under that and what it even means! It has been a while since I read Greene’s Book cover to cover, but I think he lays out an interesting comparison between the Fell and Merrivale novels that it would be fun to examine. I’m not really the one to examine it as I am simply not an expert on either. At least, not yet! 🧐 I can tell you the difference between novels featuring Christie’s sleuths, no problem. However, the first difference I grab onto between Fell and Merrivale has to do with plot complexity.